This amp is the perfect high-gain partner for recording and medium-sized gigs. Great range of high-gain sounds. Good tone circuit. Can't cope with loud clean sounds. The Orange Tiny Terror has become a modern classic since its release in 2006. It played arguably the most important role in the resurgence of low-watt valve amps, and has been revamped in various guises, from the boutique Hard Wired Edition to the dual-channel, beefed-up Dual Terror. It's even been immortalised in software in association with IK Multimedia. "Cranking the gain gives you a deliciously filthy tone." Orange's latest addition to the TT range looks unapologetically badass, but don't be fooled by that black paint job. There's more going on under the hood than you might think. It features the same switchable 15-watt/seven-watt output control as the original, but you get another ECC83 preamp valve, totalling four stages of gain. The preamp also features a new tone circuit, based around a revoiced version of the Shape control found in Orange's TH series amps. At 15 watts, the Dark Terror can do clean, but as with the original, it's limited. Setting the amp up with low gain/high output settings in 15-watt mode will give you the most headroom for clean sounds when practising or recording, but introduce a drummer - particularly of the metal variety - and you'll most likely be forcing the amp into break-up. Speaking of which, the Dark Terror does a bang-up job with those thick Angus style overdrives, too, but if you've played any of the Terror series before, you'd expect that. Cranking the gain is probably what will draw most people to this amp in the first place, so we'll be blunt: it's deliciously filthy. In either mode, cranking the preamp gain and raising the level to suit gets you a rich slice of high-gain valve tone. At this point, the Shape control is your friend. Turned to the left it gives you a fat, mid range-y sound, and turned to the right it becomes progressively more scooped. The resulting combination of sounds that can be achieved between this and the Gain control range from slightly woolly classic metal, to thick classic rock all the way to a Dime-style tight scoop with a stabby high end. Try it through a 4x12 like we did, and you shouldn't have a problem keeping up with the rest of your band. Often when we review 'lunchbox' amps, the range of rock guitar sounds peaks at classic metal in terms of heaviness. 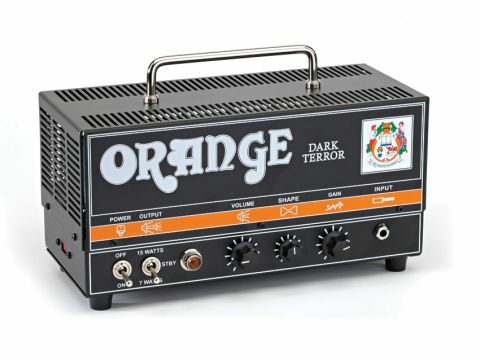 Take a look at Orange's endorsee roster and you'll see that the company knows a thing or two about 'heavy', and the Dark Terror takes it to the next level for an amp of its stature. As long as you're not looking for pristine clean sounds, you can live with its single channel design, and you run it through a decent-size cab, this amp is the perfect high-gain partner for recording and medium-sized gigs.